Website ini merupakan website yang diperuntukan mempublikasikan karya-karya ilmiah peneliti, dosen, mahasiswa ataupun praktisi. Website ini dikelola oleh Pusat Penelitian dan Pengabdian kepada Masyarakat (PPPM) Nusa Mandiri. Terdapat 4 (empat) jurnal ilmiah yang dikelola oleh PPPM Nusa Mandiri, yaitu: PILAR Nusa Mandiri, TECHNO Nusa Mandiri, JITK Nusa Mandiri dan INTI Nusa Mandiri. 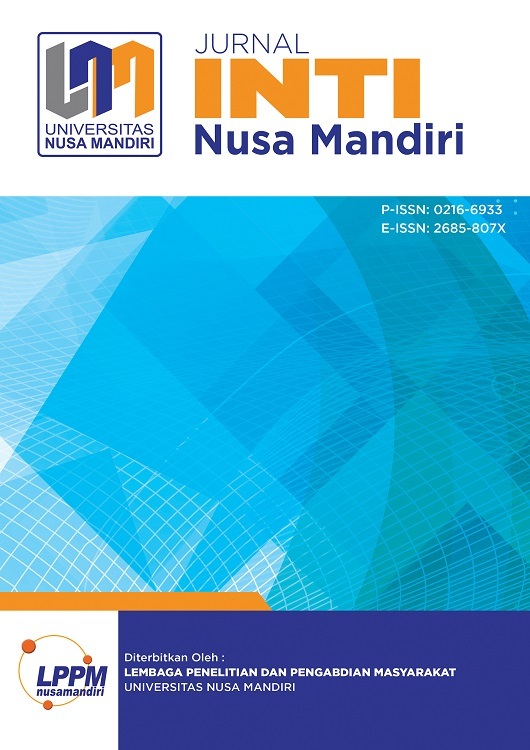 The PILAR Nusa Mandiri Journal is a formation of the Information Systems study program, which was originally a medium for accommodating scientific writings of STMIK Nusa Mandiri Jakarta Information Systems lecturers. Along with the times, this journal has become a National journal that has P-ISSN: 1978-1946 and E-ISSN: 2527-6514. PILAR Nusa Mandiri has become a Rank 3 Accredited Journal and is trying to become a higher accredited journal. PILAR Journal Nusa Mandiri is published 2 times in 1 year, namely in March and September. This journal is Rank 3 Accreditation Certificate (S3), Accreditation is valid for 5 years. Starting from Vol. 12, No. 1 the Year 2016 to Vol. 16, No. 2 the Year 2020. The TECHNO Nusa Mandiri Journal is a journal published by the Community Service Research Center (PPPM) STMIK Nusa Mandiri Jakarta. The TECHNO Nusa Mandiri Journal was originally intended to accommodate scientific papers made by Informatics Engineering lecturers. The TECHNO Nusa Mandiri Journal with the accredited National Journal status is accredited by the Indonesian Ministry of Research and Higher Education at the Sinta S4 level, in accordance with Decree on Strengthening SK Research and Development Number 21 / E / KPT / 2018 which has been in effect since July 9, 2018, for 5 years. Source: Risbang Ristekdikti.go.id. This journal is Rank 4 Accreditation Certificate (S4), Accreditation is valid for 5 years. Starting from Vol. 13, No. 1 the Year 2016 to Vol. 17, No. 1 the Year 2020. 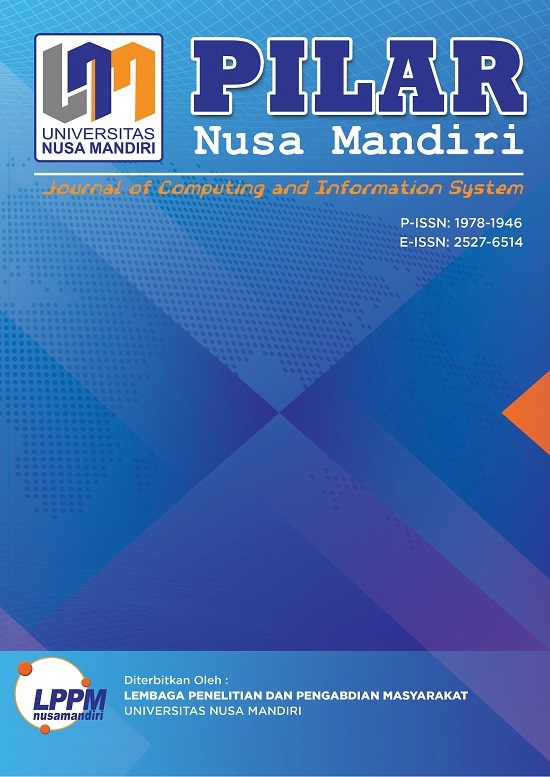 JITK (Jurnal Ilmu Pengetahuan dan Teknologi Komputer), STMIK Nusa Mandiri is a scientific journal in the field of computers that contains scientific writings as a result of research by lecturers, researchers & practitioners who have the competence of Computer Science STMIK Nusa Mandiri. This journal is expected to develop research and make meaningful contributions to improve research resources in Information Technology and Computer Science. JITK was published by the Nusa Mandiri Community Research and Service Center, STMIK Nusa Mandiri Jakarta. Scientific articles at JITK come from study programs at STMIK Nusa Mandiri Jakarta, including Masters in Computer Science, Informatics Engineering, Information Systems. To submit scientific articles to JITK, first read the article shipping instructions in the next link. Jurnal INTI Nusa Mandiri merupakan jurnal yang diperuntukan keilmuan Computer science (Ilmu Komputer). kajian keilmuan mencakupi tentang komputasi, perangkat keras (hardware) maupun perangkat lunak (software). Ilmu komputer mencakup beragam topik yang berkaitan dengan komputer, mulai dari analisis abstrak algoritme sampai subyek yang lebih konkret seperti bahasa pemrograman, perangkat lunak, termasuk perangkat keras. Ilmu Komputer lebih menekankan pada pemrograman komputer, dan rekayasa perangkat lunak (software).